Here’s a quick way to own your own digital copy of The Deep Set to listen to straight away – QUICK download in quality MP3 and many other formats from our Bandcamp store. Take a short trip to our own digi shop on our FREE virtual buzz bus. Bats rarities, and offshoot band releases from Minisnap and The Archers (with Hamish Kilgour), John White (Mestar, The Blueness) . More being added each month. Or for vinyl, CD’s and other downloads head to our lovely label or one of our distributors near you around the planet. For some good honest reviews and ratings or all Bats releases go to All Music Guide. A recent addition to the digi shop is The Guilty Office, originally released in 2009 through Kning Disk in Scandinavia, Arch Hill Recordings in New Zealand, Mistletone in Australia and Yes Boy Ice-Cream in Europe. This was during a period where Flying Nun were locked away in the dungeons of a major label. Pitchfork have some nice things to say about the album. We’ve added a few extra tracks to the Minisnap “March Hare” EP. Code2 was an early CDR single from around the time that never got included in an LP or EP. Whistler and Human Error were released by Cloudberry records as a 7inch single. Good price on this as it’s still at the EP rate but is closer to a full album. Feel free to donate extra to help with our future projects. 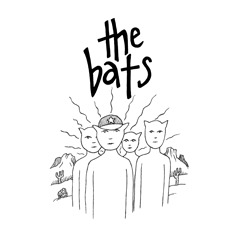 The Bats at The National Grid – released in 2005 when Flying Nun were having a snooze. We trust Pitchfork to let you know more about this album. The Bats celebrated the release of their 9th LP and 30th anniversary of their 1st LP, Daddy's Highway with tours of New Zealand, Australia, EU and UK. The EU tour started off in Lyon on 31st May through to London on 17th June. They played a good bunch of songs from both albums including many favourites from between. Key dates are on the Gigs page if you want to check. Currently editing videos and writing material for a new Bats record and no plans to tour at present. We're looking into compiling Volume 2 of our middle period releases, Fear of God, Silverbeet, Spill The Beans and unreleased material.